Spike Crews are the ultimate #throwback. Put on a VYCC green uniform and help us change the world. Our Conservation Crews spend the summer and fall improving the health and accessibility of the outdoors. Apply Today! Apps are due May 1, 2019. 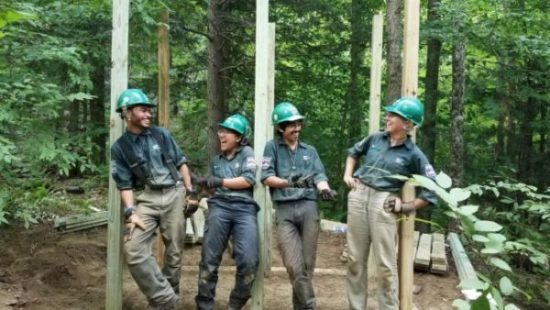 We are looking for young people ages 15-26, to work on these camping (spike) crews across Vermont. Get paid to work outside for 8 weeks between June and August, for 8 weeks from September-October, or for both seasons, June-October. Almost 100 years ago (wow), the Civilian Conservation Corps was created to put men to work building National Parks and outdoor public spaces during the Depression. The camped and lived where they worked. We took the best parts of that model and improved it. Our Spike Crews are super diverse in social identities and ages and do way more than just build trails. What are the 2019 sessions? How many sessions can I work? Are all Spike Crews the same? How big are the crews? Who else is on the crew? How much do you get paid and how often? What does the work day/week look like on a Spike Crew? What kind of work/projects does a Spike Crew do? What does education look like at VYCC? What are this year’s session dates? How many sessions can I work? Our seasons are broken into sessions over the course of the summer and fall, with a “recharge” week between each session. Our fall session is from August 22 until October 20, 2019. An 8-week span from either June 15 until August 18 (both summer sessions) or August 22 until October 29 (fall session). A 16-week span from June 15 until October 29. *Please note, youth Spike Crew Members MUST be Vermonters! If you have any conflicts within the session, please let us know and we will see what we can do! We have a number of Spike Crews (camping) which work across the state on a range of projects including trail work, watershed protection, and more. We strive for all our crews to have a balance of social identities, especially gender identities. 2nd session: July 22 until August 18. A crew for Corps Members youth (15-18 years old) who identify as girls, young women, and/or young transwomen. This crew is designed to give Corps Members the chance to explore the conservation field in an environment focused on support, encouragement, and empowerment. Because conservation and other technical trades traditionally have been dominated by cis-men, studies have shown that similar underrepresented identities programs, such as all-women/transwomen programs can be highly effective in building confidence and inspiring them to enter these technical arenas. The members of this crew will be pushed to explore and learn together, and will expand their comfort zones as they build projects and live in a camp setting. Crew Members will benefit from the mentorship of highly-trained leaders, who will add a focus of empowerment, sharing, and support to the crews daily activities. Note: WoW Crew Members must be ages 15-18. This is an integrative Youth Corps experience for young people (15-18 years old) who are Deaf or Hard-of-Hearing. 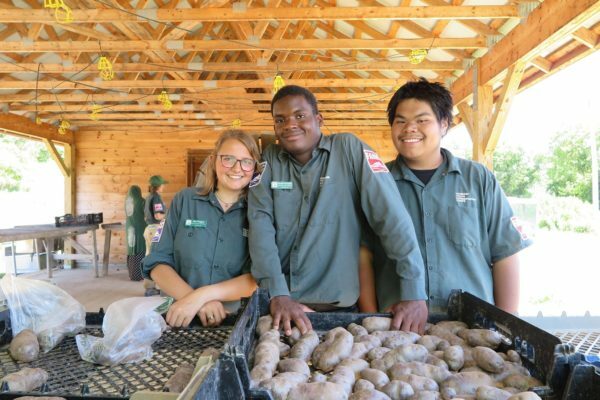 VYCC and partners develop an integrated, residential, work-immersion experience in-line with the VYCC’s traditional youth conservation program. This model pairs crew members who have hearing with those who are deaf or hard of hearing under the guidance of two leaders proficient in American Sign Language (ASL). This crew is a camping crew and works primarily out with the US Forest Service or other land management agencies/organizations. Note: ASL Crew Members must be ages 15-18. This year we will host 4 regional crews that will camp near their work site. These crews will be made up of Vermont youth from the region! This crews will be focused on everything all different types of projects: land management, trail building and maintenance and water quality work! 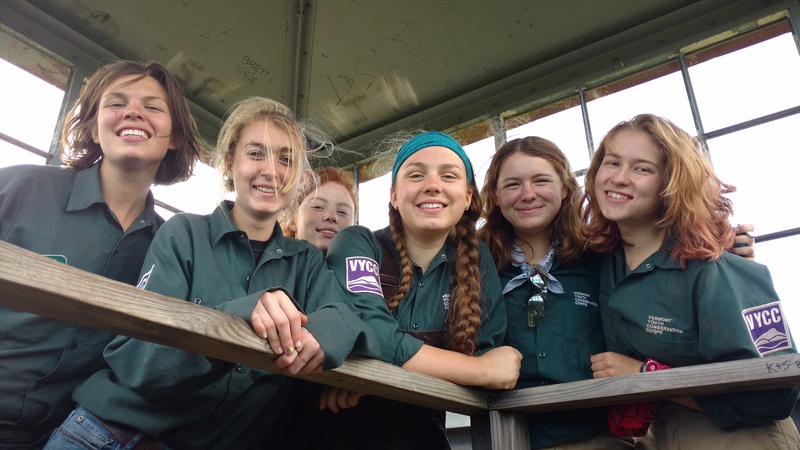 Youth Crew Members are Vermonter’s between 15 and 18 years old. Young Adult Crew Members are between 18 and 24 years old. How big are crews? And who else is on the crew? Crews are made up of 6-8 Crew Members and 2 Crew Leaders. Youth Crew Members are be from all over Vermont and Young Adult Crews Members may be from all over the county. Crew Members get paid every 2 weeks. Young Adults are AmeriCorps Crew Members, earning a weekly stipend* and a Segal Education Award at the end of their session. You work approximately 40 hours per week. Note: VYCC takes $60/week from compensation for room and board costs. Crew Member applications are due on May 1, 2019. Crew Leader applications are due on April 1, 2019. Spike Crews start their sessions at our Headquarters in Richmond, VT. After a few days of orientation or “Start-up”, crews hit the road and set up camp near their worksite. Crews spend some time getting camp set up before their first day on the job site with project sponsors from the area. 5:30 p.m. Start cooking or free time. Cooking responsibilities rotate throughout the crew! 9:30 p.m. ZZZZZZZ or at least everyone in tents. What do crews do on the weekends? A combination of errands and fun! Errands may include laundry, grocery shopping, and tool maintenance. Fun is dependent on the crew! Crews may explore the local area by going on a hike, hanging out in the town, checking out the farmers market or relaxing at camp! Crews also will get together with other crews out in the field or come back to VYCC Headquarters for All Corps Meet-Ups. Where do Spike Crews camp and what do the camps look like? Camps are always at designating camping locations whether that be at a State Park, camping ground or along a trail system. We follow Leave No Trace© policies to leave pristine camps for those that come after. There are designated areas for camping, cooking/eating, and bathroom “facilitrees”. What food do Spike Crews eat? What do you like to eat?!?! Crews work together to set menus for the week and go grocery shopping. Some classic VYCC meals include burritos, veggies from the VYCC Farm, pasta dishes, soup, one pot wonders, etc. The sky is the limit. Some crews have made their own bread to bring out too! Meals will have limited meat and dairy as there is limited refrigeration at the camps. Any personal gear, you’ll need to bring with you. This includes your water bottle, boots, sturdy clothing, raingear, backpack, etc. If this is challenge, please let us know as we can work with you! We provide Spike crews with tents, cook gear, and all the tools, equipment and transportation to the worksite your crew needs. Projects will range based on the needs of the community and may include trail building and maintenance, tree planting, invasive species removal, improving waterways, and maybe some carpentry. Crews work with a variety of sponsoring agencies including the U.S. Forest Service, The U.S. Army Corps of Engineers, Vermont Departments of Forest, Parks and Recreation and Fish and Wildlife, and various other local and national non-governmental conservation organizations. These relationships expose crews to a variety of future employment options and allow the opportunity to network with many professionals. What does VYCC education look like? Education at VYCC looks different depending on the crew’s interests and will happen out in the field or sometimes back at our Headquarters in Richmond, VT. It tends to be a variety of readings, writing opportunities, and discussions as a crew. Crews also have an opportunity to learn wildlife and plant identification, skill share with fellow Corps Members, and visit with a variety of professionals in the field. What’s an AmeriCorps Education Award? The AmeriCorps Education Award can help pay for student loans, college classes, or other educational programs. Check out our Use Your Education Award page for more information on how you can utilize these funds! The AmeriCorps Education Award amount will vary depending on the length of time you spend at VYCC in a position. AmeriCorps Spike Crew Members can earn up to $2,960 in an Education Award. Apply now! Apps are reviewed on a rolling basis and due May 1. The VYCC is committed to creating a diverse environment and is proud to be an equal opportunity employer. Applications from diverse racial, ethnic, and cultural backgrounds, women and gender fluid individuals, individuals of all sexual orientations, veterans, and individuals with disabilities are encouraged. All eligible applicants or job-holders have an equal opportunity in all areas of VYCC employment.